1استاد گروه پاتولوژی. گروه پاتولوژی، دانشگاه علوم پزشکی و خدمات درمانی و بهداشتی شهید صدوقی یزد. 2پزشک عمومی.دانشگاه علوم پزشکی و خدمات درمانی و بهداشتی شهید صدوقی یزد. زمینه و هدف: به علت فراوانی زیاد موارد تیروئیدکتومی و برداشته شدن اتفاقی پاراتیروئیدها به عنوان عارضه در این عمل و در نتیجه هیپوپاراتیروئیدی گذرا و دائمی، بر آن شدیم تا به بررسی شیوع پاراتیروئیدکتومی اتفاقی در افراد تحت تیروئیدکتومی پارشیال یا توتال بپردازیم. روش بررسی: مطالعه حاضر از نوع توصیفی-مقطعی و گذشته نگر بوده و اطلاعات بیماران تحت تیروییدکتومی قرار گرفته شده به روش سرشماری مورد مطالعه قرار گرفتند. متغیرهای مورد نیاز شامل: سن، جنس، نوع پاتولوژی، وضعیت برداشتن پاراتیروئید، فیلد جراحی پزشک، وضعیت بدخیمی، سایز تیرویید برداشته شده و نوع عمل جراحی انجام شده از پرونده های بیمارستانی و بخش پاتولوژی توسط چک لیست از قبل تهیه شده جمع آوری شدند. اطلاعات بدست آمده وارد نرم افزار SPSS ورژن 17 شده و با استفاده از تست های آماری مورد تجزیه و تحلیل قرار گرفت. نتیجه ­گیری: با توجه به نتایج می­توان گفت پاراتیروئیدکتومی اتفاقی به دنبال جراحی تیروئیدکتومی از فراوانی بالایی برخوردار نبوده و فاکتورهای وضعیت بدخیمی ضایعه، نوع بخش بستری، سابقه جراح و نوع پاتولوژی ضایعه بر روی فراوانی آن موثرمی باشد. 1-Brunicardi PC,BrandiM,andersenDK,etal.Surgicaltretment strategy for thyroid gland.Ear Arch Otorhinology 1997;254(12):169-174. 4-Ready AR,barnesAD.Complication of thyroidectomy.Br J Surg 1994;81(11);1555-6. 5-Shiryazdi SM, Kargar S, Afkhami-Ardekani M, Neamatzadeh H. Risk of postoperative hypocalcemia in patients underwent total thyroidectomy, subtotal thyroidectomy and lobectomy surgeries. Acta Med Iran 2014;52(3):206-209. 6-Manatakis DK, Balalis D, Soulou VN, Korkolis DP, Plataniotis G, Gontikakis E. Incidental Parathyroidectomy during Total Thyroidectomy: Risk Factors and Consequences. International Journal of Endocrinology. 2016;2016. 7-Sippel RS, Özgül Ö, Hartig GK, Mack EA, Chen H. Risks and consequences of incidental parathyroidectomy during thyroid resection. ANZ journal of surgery. 2007;77(1‐2):33-6. 8-Erbil Y, Barbaros U, Ozbey N, Aral F, Özarmağan S. Risk factors of incidental parathyroidectomy after thyroidectomy for benign thyroid disorders. International Journal of Surgery. 2009;7(1):58-61. 9-Gourgiotis S, Moustafellos P, Dimopoulos N, Papaxoinis G, Baratsis S, Hadjiyannakis E. Inadvertent parathyroidectomy during thyroid surgery: the incidence of a complication of thyroidectomy. Langenbeck's Archives of Surgery. 2006;391(6):557-60. 10-Manatakis DK, Balalis D, Soulou VN, Korkolis DP, Plataniotis G, Gontikakis E. Incidental Parathyroidectomy during Total Thyroidectomy: Risk Factors and Consequences. International Journal of Endocrinology.2016;2016. 11-ÖZOĞUL B, AKÇAY MN, KISAOĞLU A, Atamanalp SS, ÖZTÜRK G, AYDINLI B. Incidental parathyroidectomy during thyroid surgery: risk factors, incidence, and outcomes. 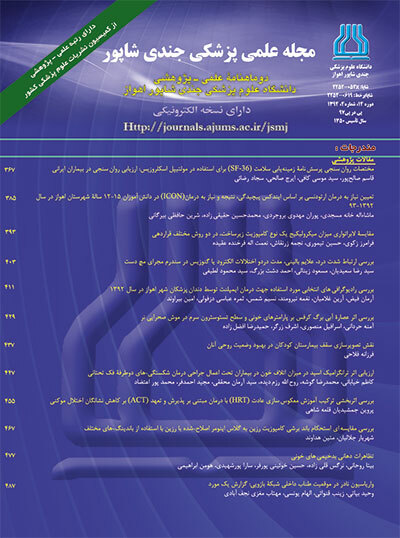 Turkish journal of medical sciences. 2014;44(1):84-8. 12-Campos NS, Cardoso LP, Tanios RT, de Oliveira BC, Guimarães AV, Dedivitis RA, Marcopito LF. Risk factors for incidental parathyroidectomy during thyroidectomy. Brazilian Journal of otorhinolaryngology. 2012;78(1):57-61.